After 33 years broadcasting out of an airless and fluorescent-lit basement on Santa Monica Community College campus, KCRW will soon move into a bright new above-ground building, designed by Clive Wilkinson Architects, that is far more welcoming to the public. 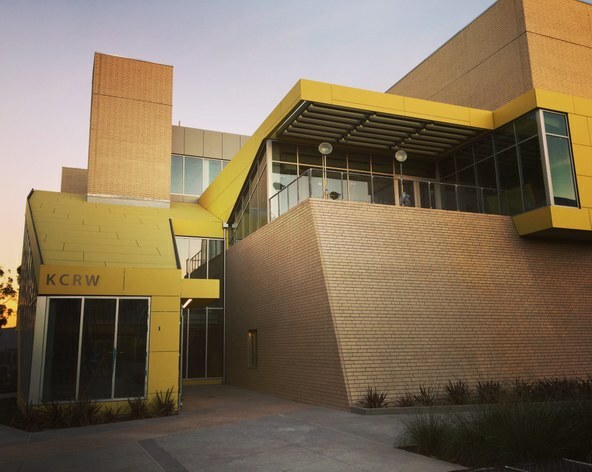 Wilkinson, whose past projects include the first Googleplex in Mountain View and ad agency TBWA/Chiat Day's offices in Playa Vista, was tasked with building a ground-up structure for KCRW on a satellite SMC campus that would join two classroom buildings, one dating to the 1970s, one new. The three structures make up the Center for Media and Design and form a satellite campus at Olympic and Stewart, walking distance from the Expo Line. The three surround a plaza and together they form a broadcast station and school for students of communications and media design. 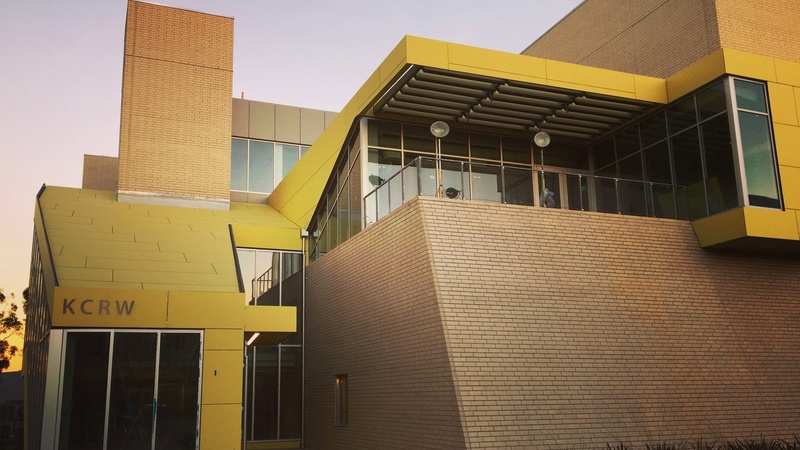 Wilkinson knit together the buildings with beige brick and yellow fiber cement panels. It feels somewhat industrial, somewhat Pop. The yellow signals public areas like the large staircase that projects from the building, and a shared outdoor terrace. Inside you'll find a light, large open plan office space, punctuated by by two bright orange glass conference rooms and one that has a fluorescent yellow-painted wall and floor. Studios are clad in wood. In a nod to the long, creative years in the loved-but-hated bunker, staff will eat lunch in a gathering space with an outdoor terrace, named The Basement. But the most radical departure from the present home is the public space. 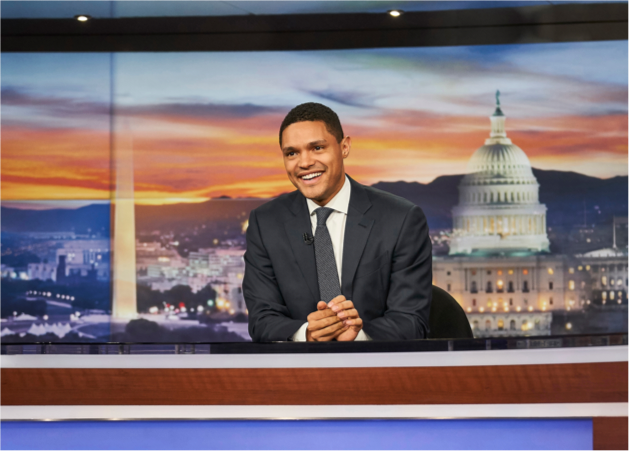 KCRW listeners will be invited to attend concerts and news and talk events held at an outdoor stage in the plaza or inside in the performance studio where MBE will be recorded. Clive Wilkinson and his team began work on KCRW's new building around a decade ago. A Santa Monica bond measure paid for the construction and KCRW capital campaign donors -- over 5,800 families who gave a dollar or more -- paid for the broadcast equipment and technology. After some construction delays the building is now nearing completion and on Saturday supporters will get a sneak peek. DnA toured the campus with Clive Wilkinson, who talks about his choice of "happy colors", why context matters more than "frivolous technological developments," and why staffers don't need to worry about "getting above themselves" in the new building. KCRW's veteran staffers Ariana Morgenstern, Steve Herbert, Matt Holzman and Bob Carlson share their thoughts on the move. When asked if she will miss our longtime digs, Morgenstern said the big windows in the new building are going to be a joy for the Vitamin D-deprived station staff with their "studio tans," and bands will love having an audience when they perform. She added, with a smile, "I'm going to miss the stink sometimes. I will miss not having a sink in the kitchen. I will miss those days when the air conditioner goes out and everybody's in a sauna."